The Rolex 24 Hours of Daytona 2014 was held January 25-26 at the Daytona International Speedway in Daytona Beach, Florida. The 12-turn, 3.56-mile track is made up of portions of the NASCAR tri-oval and an infield road course. The 52nd running of the Rolex 24 at Daytona maintained tension right to the finish as a yellow flag 20 minutes from the end shrank the gap between the leading cars. In a race of attrition that saw several top teams fall by the wayside in the closing hours, the #5 Action Express Racing Corvette Daytona Prototype snatched overall victory by a mere 1.461 seconds. In the Prototype Challenge class, the ORECA FLM 9 of CORE Autosport took the class victory, while in GT Le Mans and GT Datyona, it was #911 Porsche 911 RSR of Porsche North America and #555 Level 5 Motorsport’s Ferrari 458 Italia that topped the podium in their respective classes. The race featured 52 lead changes, with the winning Action Express team leading 18 times for 313 laps, and the Wayne Taylor Racing team 12 times for 228 laps. The winning team completed 695 laps on the 3.56-mile circuit, covering 2,474.2 miles for the team owned by Daytona Beach businessman Bob Johnson. This year’s race was marred in the early going by a horrific crash when Memo Gidley – driving the pole-winning No. 99 GAINSCO Corvette DP – rear-ended the disabled No. 62 Risi Competizione Ferrari F458 Italia driven by Matteo Malucelli. Both drivers were taken to nearby Halifax Hospital, where they are undergoing treatment. The race was red-flagged for 55:45 minutes after the incident. In the Prototype Challenge class the battle was hard-fought even if the gap to the next car was over one lap. Three months after setting the all-time speed record on the 2.5-mile Daytona tri-oval, Colin Braun took his first Rolex 24 victory in Prototype Challenge. Braun swept to a one-lap triumph in the No. 54 CORE autosport ORECA FLM09 with Jon Bennett, Mark Wilkins and James Gue. Enzo Potolicchio, Tom Kimber-Smith, Mike Marsal and Rob Huff took second in the No. 25 8Star Motorsports entry, followed by Ryan Booth, Raphael Matos, Tomy Drissi, Gabriel Casagrande and Julio Campos in the No. 38 Performance Tech Motorsports entry. Porsche factory pilots Richard Lietz (Austria), Nick Tandy (Great Britain) and Patrick Pilet (France) won the highly-competitive GT Le Mans class of the sports car classic in Florida with the Porsche 911 RSR run by the Porsche North America factory squad. 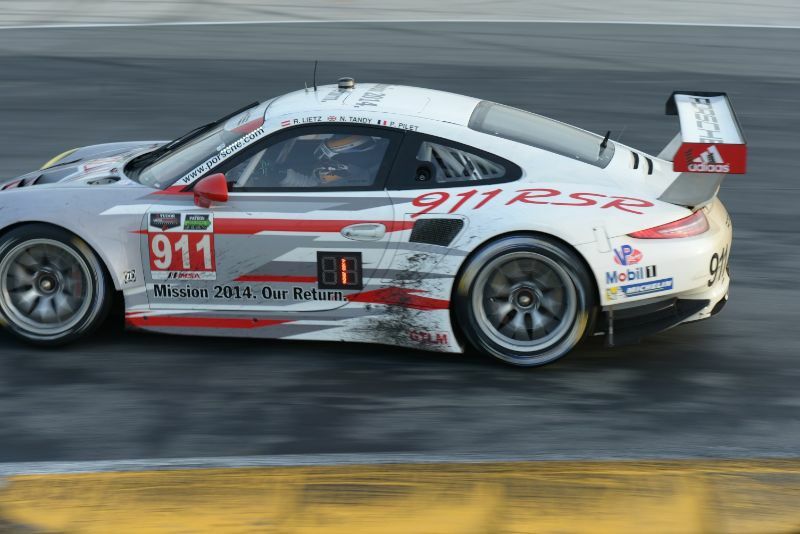 With the 76th class win and the 40th for the Porsche 911, Porsche added to its record as the most successful manufacturer in the history of this race. 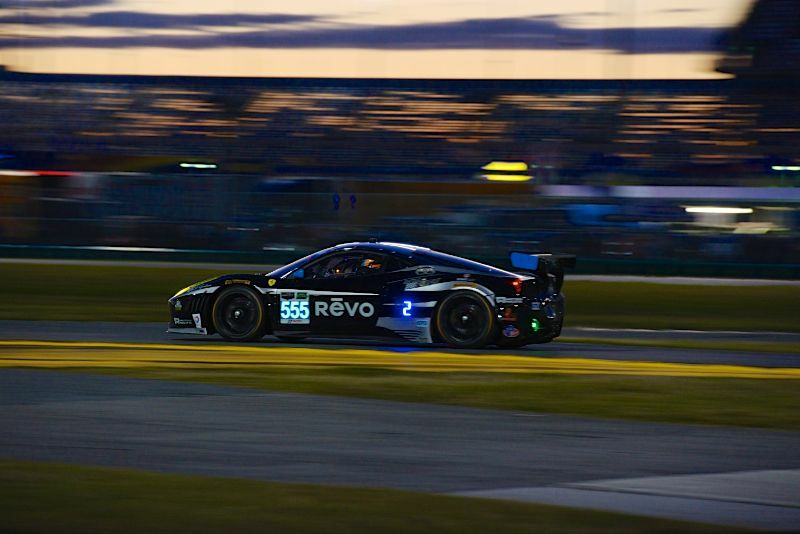 The GT Daytona winning #555 Level 5 Motorsports Ferrari 458 Italia staked an early claim to their class title, hitting the front in the fifth hour of the race. The team looked relatively secure until dawn this morning when the challenge of #45 Flying Lizard Audi R8 LMS became a real threat. For the next six hours the two cars traded places. Over the final two laps the pair raced side-by-side, neck and neck, culminating in a racing incident that saw the Audi R8 lose out in a tight battle for Turn 4 on the last lap. 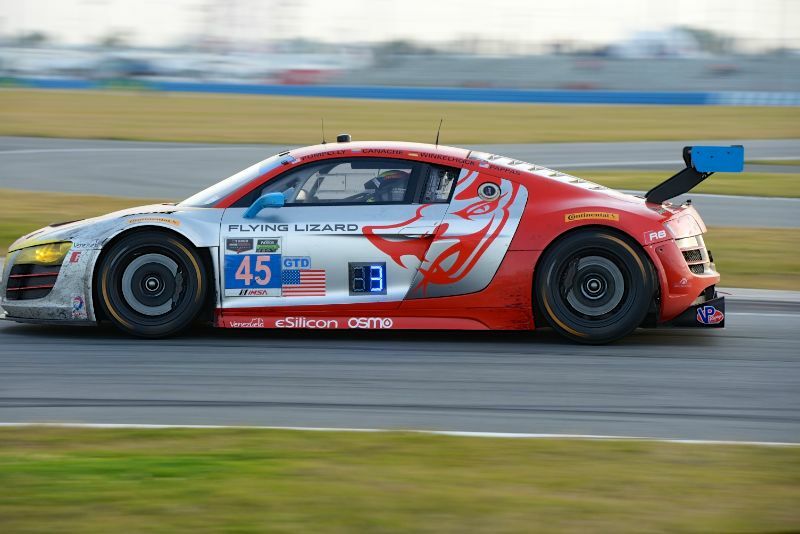 The race director imposed a time-penalty on the Level 5 Ferrari 458 Italia for ‘avoidable contact’, which enabled the #45 Audi R8 LMS of Audi customer team Flying Lizard Motorsports to take the checkered flag. Upon further review, IMSA revised their original decision to impose a time-penalty on the #555 Ferrari 458 Italia. The #45 Audi R8 LMS, which had originally been declared as the winner of the race, was moved back to second place. David Hobbs served as Grand Marshal for 2014 edition of the Rolex 24 Hours of Daytona. Hobbs raced in the inaugural Daytona Continental, when the young British driver was among the drivers invited by Bill France Sr. to build an international field for the 1962 event. Within four years, that race grew to 24 hours, with Hobbs driving a Ford GT40 in two races. He won his class in 1981 in a BMW, and returned at the height of the IMSA GTP days to race Jaguar and Ford prototypes. 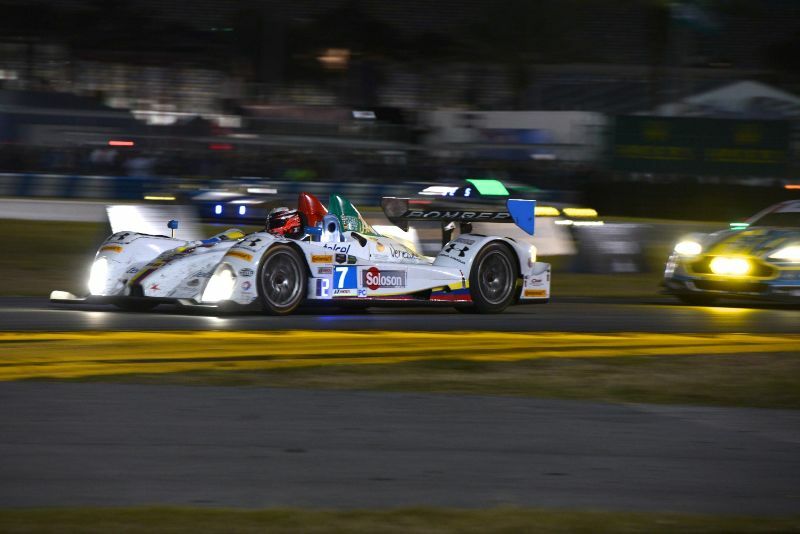 Similar to 2013, photographer Mark Coughlin documented the racing action at the 2014 Rolex 24 Hours of Daytona, offering the following images that highlight the endurance race and the heritage racing exhibition. Since the race officials have access to the same TV coverage as the viewer, how could they make a “avoidable contact” call and penalty. What a bunch of jerks. I’ve been going to the Daytona Rolex24 HR since the 60’s (Sebring & Road Atlanta, too). This 2014 race was one of the best. Glad to see ALMS and Grand-Am combine. Putting real-time class positions on the side of the cars was a neat idea. Woody Soderlind. Is this Woody from Peachtree Park Drive in the early ’70s?